Garnering the coveted No. 1 pick in the loaded 2014 NBA draft is a luxury bottom-feeder teams will be anxiously eyeing in the league’s annual draft lottery Tuesday night in New York. That’s especially the case for a team like Milwaukee, which went 15-67 in 2013-14, or the rebuilding Philadelphia 76ers, who lost 26 in a row last season. Tanking speculation aside, securing the No. 2 or No. 3 pick still could provide franchise-changing fortune this year. 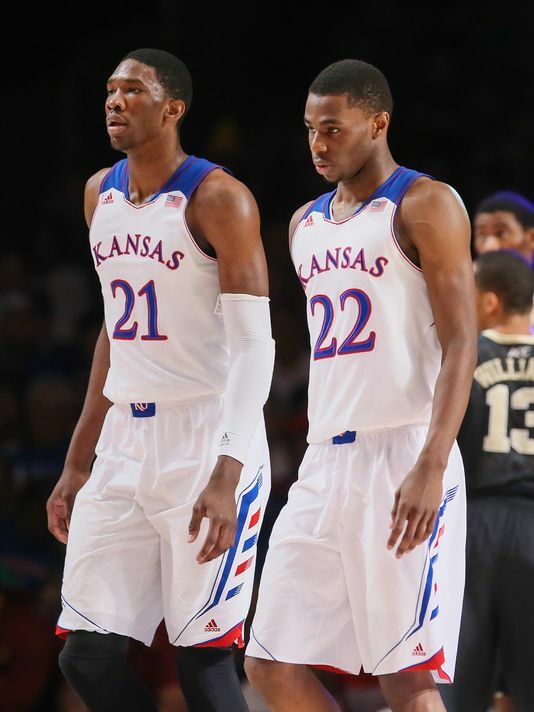 Kansas stars Andrew Wiggins and Joel Embiid and Duke forward Jabari Parker all are candidates to hear their name called first by NBA Commissioner Adam Silver. They’re the headliners helping this year’s draft class draw comparisons to 2003, when LeBron James, Dwyane Wade, Chris Bosh and Carmelo Anthony were top five picks. “There’s not a Tim Duncan or LeBron James available this year, but this is one of the best drafts in terms of talent,” ESPN analyst Jay Bilas said. “I’m not sure there’s a firm handle on who will go No. 1. The Bucks were the worst team in the NBA this past season and enter Tuesday’s lottery with the best odds to haul in the top pick at 25%. But the worst team doesn’t always get the No. 1 or even a top-three pick, evidenced by the Charlotte Bobcats in 2012. 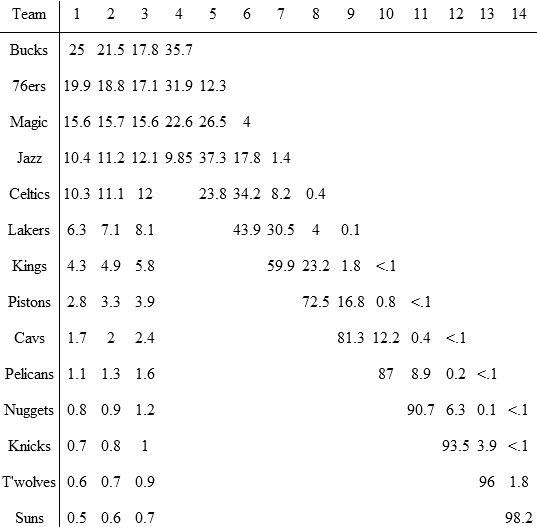 If Milwaukee or Philadelphia don’t come out on top, a strand of other franchises in rebuilding mode — the Orlando Magic (15.6%), Utah Jazz (10.4%), Boston Celtics (10.3%) and Sacramento Kings (4.3%) — are all positioned to take home the No. 1 ping pong ball. The surprise of the draft lottery could be Los Angeles Lakers, should the league’s most storied franchise get the top pick. The Lakers have a 6.3% chance of getting the No. 1 pick after missing the playoffs for the first time since 2005. Following an unprecedented lack of talent in last summer’s draft — the top pick, Anthony Bennett, averaged 4.3 points and 12.8 minutes a game in 2013-14 — this summer’s draft class showcases an influx of talent that will make teams without the best odds satisfied on Tuesday. The chart below features the percentage chance of each team landing in each draft slot. Blanks are for teams that cannot fall to that spot in the draft. Notes: The Nuggets own the rights to the Knicks’ pick but will send the lesser of their two picks to the Magic. The 76ers own the rights to the Pelicans’ pick unless it lands in the top three. The Bobcats get the Pistons’ pick if it falls out of the top eight. The Timberwolves will send their pick to the Suns only if they fall to No. 14. You are currently reading 2014 NBA draft lottery means everything to some teams at ARE YOU NEXT.